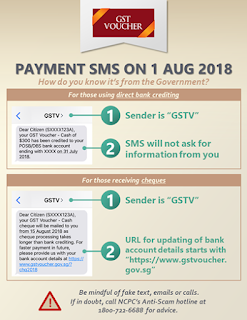 Eligible Singaporeans who will receive their 2018 GST Voucher (GSTV) cash payouts this month should be wary of receiving fake SMSes, calls or emails regarding the payment. 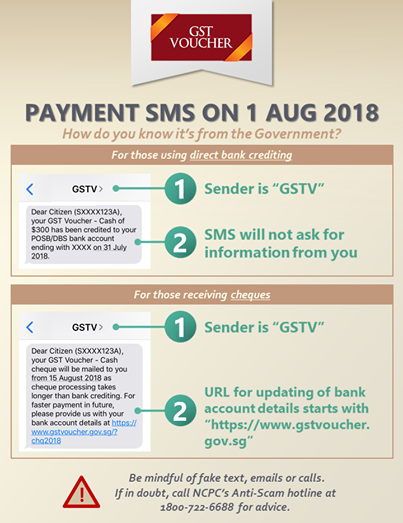 The Ministry of Finance (MOF) said in a Facebook post on Wednesday (Aug 1) that the SMS should come from sender "GSTV", adding that the text will not ask for any information. It also posted an infographic on what recipients should look out for in telling an official SMS apart from a fake one.